The Peguche Waterfall is a beautiful waterfall of approximately 20 meters high by 3 wide, it is within forty hectares of forest declared as "Peguche Waterfall Protective Forest".It is located 23 kilometers from Ibarra, 10 minutes from the Panamericana Norte exit from Otavalo and 2 km from the Peguche parish. This waterfall originates at the foothills of Imbabura volcano, right at the northern tip of San Pablo Lake located 4 km south of Otavalo at 8,760 ft. (2,670 m). The course of its waters runs downstream by the river of the same name, Peguche, which change its name into Jatun Yacu (big water) right after it tumbles free down the waterfall. 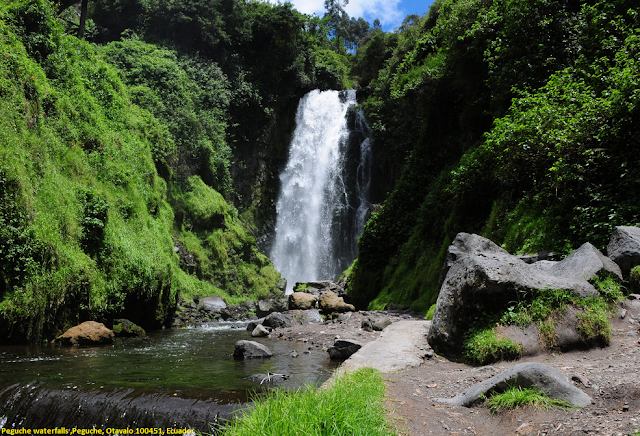 There is public transportation available in Otavalo to get to the waterfalls at parque central Simon Bolivar. Buses leave every 20 minutes from there. You can also flag a taxi anywhere in town (USD. 2,00 one way). But it’s highly recommendable the hike from Otavalo. This option is worth it.